The Windsor style has been around for almost 300 years. Classic lines gracefully framing negative space have led some to refer to the chair as utilitarian sculpture. Living among the diverse forest of the Southern Appalachian Mountains gives me access to a constant supply of high quality logs. These logs – oak, hickory, ash, maple and walnut – are then split to size using wedges and a sledge hammer. This technique, as opposed to sawing, ensures straight wood fibers providing uncompromising strength. 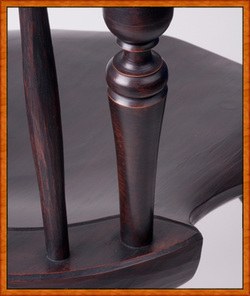 Seats for traditional styles are carved from a single board of eastern white pine while butternut, walnut or tulip poplar are used for contemporary designs. A PDF of chair prices can be found here.